I’ve held off writing about Picasso for a few weeks because I feel moved to empty the bank account and run away to live at the Bellagio casino resort every time I sit down and think about the meal. It was near-perfect; it’s almost intimidating to write about the place, because I simply don’t have a bad word to say about the experience…and that makes me look like an unthinking, uncritical sort of eater. I’m not; really I’m not – this was just quite simply the very best meal I’ve eaten in my life. Even if Picasso weren’t serving spectacularly good food, the room itself would be reason enough to visit. Right next to the Bellagio fountains (one of my favourite free Las Vegas attractions – they’re 60ft tall and they dance to a playlist of showtunes, classical music and opera), the restaurant is filled with original Picasso ceramics and paintings, and decked out with vase upon vase upon vase of fresh flowers. Between the fountains, the still-life on the wall opposite me and the enormous jugs of freesias and tulips, even the ravishingly handsome Dr Weasel was having trouble holding my attention. Despite all this grandeur, the room is designed to be very intimate, with little nooks and crannies of seating to make you feel you’re almost eating on your own. Even if the room were not filled with art and flowers, and even if those fountains weren’t swaying outside the window, the service alone would be reason enough to visit. Perfectly unobtrusive, the waiters changed dirty napkins with such skill you didn’t notice them doing it, poured exactly the right amount of wine, kept the water glasses brimming – there’s a reason the Zagat guide gives this restaurant its top score for service. I am allergic to lobster (as far as I am concerned, one of the worst things that you could choose to be allergic to – I used to love the stuff), and mentioned to the waiter that I would prefer something different for the first course of our degustation menu. Other restaurants have left me without a course when this happens, or with a portion of whatever came to hand in the kitchen (nothing is so galling as sitting there with a small bowl of pumpkin soup while the rest of the table is ripping a couple of lobsters to shreds). Not Picasso. The waiter beamed, told me I could have anything I wanted from the menu…so I took him at his word and selected poached oysters in a delicate beurre blanc, each dressed with a teaspoon of wonderful, wonderful Oscietra caviar. Heaven. If you visit Picasso, the tasting menu is fit for a king. Lobster terrine (‘totally yum’ according to Dr Weasel – bet you’re glad he doesn’t write this blog) and those aromatic, vermouth-spiked oysters came after an amuse bouche of soupe de poivrons with a truffled potato croquette to dip into the little soup pot. Scallops were sauced with a veal jus, gloriously savoury against their fresh sweetness. An escalope of seared foie gras was prepared perfectly; glass-crisp on the outside with a silky soft interior, with figs and sweet walnuts alongside. Halibut was moist and toothsome, and it seems almost churlish to call my lamb chop a lamb chop – it was one of the best pieces of meat that’s ever been past my teeth. Dessert was a lychee bavarois with one of the most ridiculous and delicious items I’ve seen on a dessert plate – a giant, chocolate-dipped fresh coconut popsicle. And the petits fours with my coffee were delicate and delightful. They even brought a set for Dr Weasel, who wasn’t drinking coffee. The wine list is large and thoughtful. On another occasion I might choose to have the wine pairing with each course, but this time we chose a Russian River unoaked Chardonnay (a wine that’s extremely difficult to find in the UK, so we tend to order it whenever possible in America), which was absolutely delicious. I love it when the wine waiter ensures he’s not pouring so fast you’ll move through the bottle before you’re really ready; at Picasso our wine was poured carefully so it lasted us until we had finished our main course. Picasso’s chef, Julian Serrano, has the James Beard award for Best South-Western Chef, five AAA diamonds, and a vast array of Zagat awards. Obviously, a meal of this quality comes at a price, and currently the degustation menu is $115. (This is a positive bargain for those of us used to European prices.) If you visit Picasso, you will need to book at least a month in advance, and make sure you dress well – there were people wearing less smart clothes in there and they looked immensely uncomfortable. I promise you that the meal you eat will be worth the dressing up, the advance booking and at least three times what you’re paying – this is something really special. Unfortunate news is that Steve Wynn has been selling the art at the Bellagio little by little to keep his head above water and generate cash flow. Seems his bottom line doesn’t look that good. Does this have something to do with his irreversable slow loss of eyesight? Frederick – Bellagio’s now an MGM Mirage property, and isn’t owned by Steve Wynn any more. (I winced when he put his elbow through Le Reve too. I’ve been reading about his art collection, and it seems he’s always had a fluid attitude to the pictures he owns – he’s always bought and sold as the market dictates, which is, I suppose, what makes him super-amazingly-hyper-rich.) I’ve still not tried any of the restaurants at Wynn Las Vegas (his new hotel), but if the addition of a new tower there and the fabulous state of the casino, which I have visited, are anything to go by, I’d say Steve’s doing just fine cashwise for now. 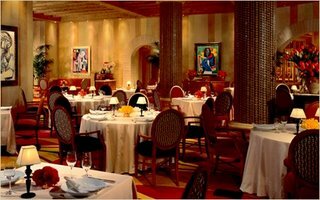 The restaurant at Bellagio, as far as I understand, is part-owned by Picasso’s son (who designed much of the room). I’m not sure who owns the pictures and ceramics, but I believe it’s not Steve Wynn. Does anyone reading know for sure? Nobody has mentioned so far that you have illustrated your review of Picasso with a picture of Chihuli’s amazing glass ceiling at Bellagio. His work is so incredible that I think he deserves a word of credit. Chihuli’s stuff was recently shown at Kew Gardens, and I would travel miles to see more of it again. Thanks for the very comprehensive and useful restaurant reviews! Thanks Jennifer! I agree – that ceiling is one of my favourite things in Vegas. You can buy one-off Chihuly glass items at a shop in Bellagio. They are, of course, heart-stoppingly expensive, but a wander round the shop is worth a good ten minutes of your time and will leave you with a real sense that you’ve just seen something rather special. There was a *brilliant* Chihuly exhibition at the V&A; here in the UK about five years ago, as well as the Kew Gardens installation. I hope he’ll keep producing work on this side of the Atlantic – he’s a wonderful artist. Great post! I will be dining at Picasso in December, and after reading your review, am more excited than ever! I did want to ask you, however, if you knew a site that lists the specific pieces of art that are displayed at the restaurant? I have been looking everywhere! Hi Tara, and thanks for reading! Unfortunately, I don’t think there’s a list online of which pictures and ceramics are on display at Picasso; they are, however, all very well labelled. I’m sure that if you ask at the restaurant, they’ll help as much as they can with identifying them. I’m also going to be there in December – wish they were open on Christmas day, though! You definitely don’t have to book a month in advance. We made a reservation the day before we left and the restaurant wasn’t full at all when we went there. I wouldn’t say it’s the best meal I’ve had, but it was pretty good. Hi Baglady – do note that this post was written well before the credit crunch, when people had rather more spare money for a) visiting Vegas and b) eating out! Thanks for the advice, though; it’s nice to know tables are more readily available now. Thanks for the review – very helpful. Just booked for next month after spending some hours trying to decide which of the Bellagio restaurants to go for – your blog tipped the balance.